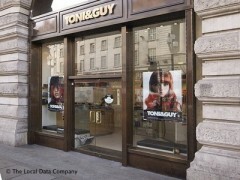 Tapco HomeDry has carried out many damp proofing projects for Tony & Guy hairdressing salons, and in accordance with our clients instructions, arrangements were made for one of our Property Care Association (PCA) qualified surveyors to survey another in Regents Street, Mayfair, The lower ground floor walls of this very busy Salon were found to be affected by a serious problem with damp which was damaging the wall plaster and causing a musty, damp smell. Because some of the Salons walls are below the external ground level and pavement of the busiest shopping street in London and was never built with a damp proof membranes, damp from above and below was freely entering the building and causing serious damage. Following a thorough survey by our Property Care Association (CA) qualified surveyor, our detailed report and recommendations were sent to our client for their approval. We chose to install a high density, Polyethylene, Cavity Drain Membrane System (CDMS) to the walls, floors and ceilings, of all the affected rooms and incorporating a sump chamber and pump to discharge any incoming water back out of the property, to a place designated by us. This was accepted by our clients and our fully trained and experienced operatives installed the system, strictly in accordance with our specification. The walls were the fitted with a galvanised frame, plasterboard, scrim tapped and plastered to a smooth finish. We were fully aware of how important the every day running of the Salon was and worked closely with our clients at all times, to achieve this.